The Museum of History and Industry (MOHAI) in Seattle is dedicated to preserving the Puget Sound region’s diverse history and highlighting its tradition of innovation and imagination. So, when the waterfront museum made the decision to renovate the historic Lake Union Armory, we envisioned awe-inspiring tensioned PTFE fabric sails to visually represent the museum’s mission of bridging the past, present, and future. Sellen Construction was tasked with the renovation of the 1942 Lake Union Armory – taking care to preserve many of the original elements of the space, including the original hardwood flooring. For the exterior renovation, they approached Eide’s Tension Structures Division because of our renowned in-house design, engineering, fabrication, and installation capabilities, and we were thrilled to create the PTFE fabric sails that line the entrance steps to the museum. Our design team pulled inspiration from the surrounding environment and community – including Lake Union and its boat docks. 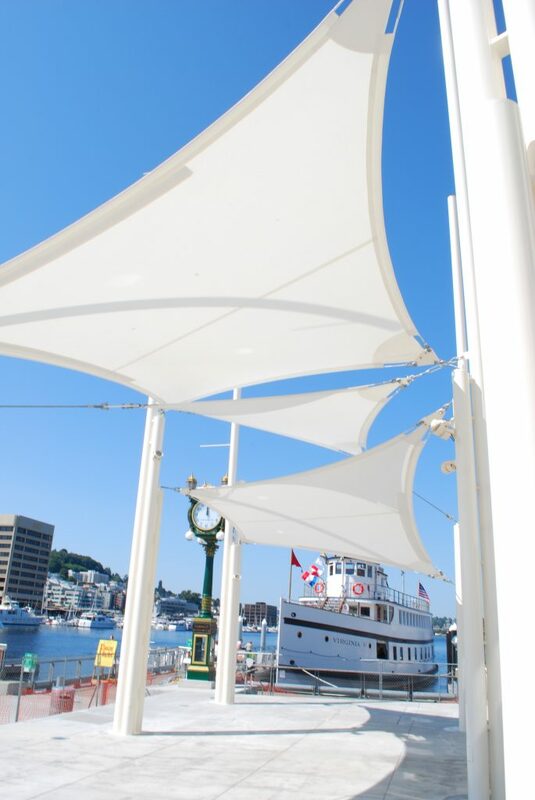 The tensioned fabric canopies were designed with (4) PTFE fabric sails in a pure white color that resembled a mainsail catching the wind, and they were supported by mast-inspired support beams. The PTFE fabric sails were created with Saint-Gobain’s SHEERFILL® II HT Fabric – which is celebrated for its ideal balance of strength and light transmission. Made of fiberglass and polytetrafluoroethylene, this architectural membrane provides exceptional durability, fire resistance, and stain resistance for projects that require a long-lifespan and design flexibility. The MOHAI PTFE fabric sails were engineered for 85 MPH Wind Loads (Exposure “C”). To learn more about your options, read our post: Exploring the Fabrics for Tension Structures. Completed in 2011 but still looking stunning today, the MOHAI building renovation won the 2013 Beth Chave Historic Preservation Award, and it is the only museum in Seattle with LEED Platinum status. Are PTFE Fabric Sails Right for Your Next Project?